In this work, a novel catalpol derivative (6,10,2′,6′-tetraacetyl-O-catalpol), which was previously obtained by our group and shown experimentally to inhibit a type of Taq DNA polymerase, was studied in silico. Studies of the interaction of 6,10,2′,6′-tetraacetyl-O-catalpol with the Klentaq fragment of the Taq DNA polymerase I from Thermus aquaticus helped to elucidate the mechanism of inhibition of the enzyme, and offered valuable information that can be used to propose substrate structural modifications aimed at increasing the binding affinity. Classical and semi-empirical methods were used to characterize the conformational preferences of this organic compound in solution. 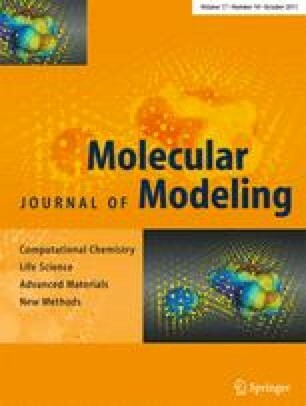 Using docking simulations, the most probable binding mode was found, and the stabilities of the docked solutions were tested in a series of molecular dynamics experiments. Results indicated that the mechanism of inhibition may be competitive, which agrees with previous binding experiments done with 6,10,2′,6′-tetraacetyl-O-catalpol. Financial support from CONICET (PIP 00628), Universidad Nacional de San Luis (UNSL) (projects 22/Q805) (PROICO 328402) and Agencia Nacional para la Ciencia y Tecnología (ANPCyT) (PICT-2007-352) is gratefully acknowledged. O. A. Martin and H. A. Garro thank the Consejo Nacional de Investigaciones Científicas y Técnicas (CONICET) for their doctoral fellowships. C. R. Pungitore, M. Kurina Sanz, and C. E. Tonn are CONICET research staff. The research was conducted using an Intel quad-core I5-750 workstation and a Beowulf cluster at the Instituto de Matemática Aplicada San Luis (IMASL-CONICET). This work forms part of the Ph.D. thesis of Hugo A. Garro.